"Best Practices for IPsec Security is to utilize X.509 cryptography for BOTH the Authentication and Encryption." This article will address the problem with (b), creating the encryption key with a “Shared Secret”. What is not stated by the token-selling community (be it “hard” token or “soft” token”) is that the actual encryption channel is still a “manually” distributed “shared key”. The shared key is often distributed via an easily attackable channel such e-mail, FTP sites and/or a shared document repository. It is this manual process that makes the IPsec channel most vulnerable – that is not the fact that it’s a shared secret – but how the shared secret is distributed. OK, enough FUD. How does one set up a secure VPN channel, where the encryption channel is NOT trivially hacked? 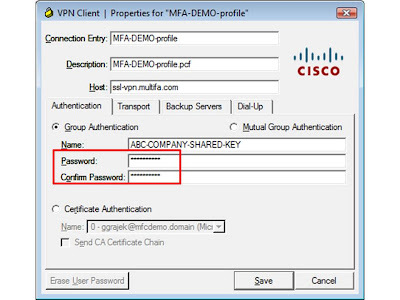 The “best practice” solution is to utilize X.509 public/private key technology. 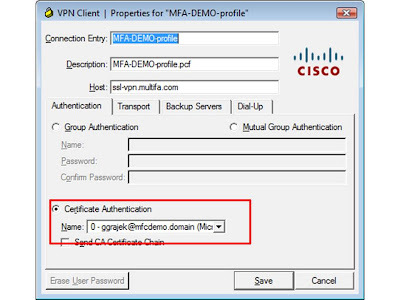 This means distributing a PKI certificate to an end user and setting up the encryption using that certificate. 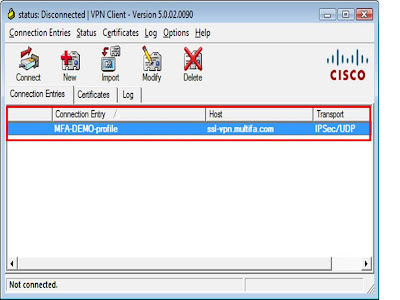 2) Have the end-user create a IPsec profile using the distributed key pair. But wait – what if there was a system that can automate these (2) practices? There is. It’s called “MultiFactor SecureAuth® for VPNs”. But to truly make the process secure – we have to contend with informing the IPsec client how to create the encryption channel – with the X.509 key pair that was just created. Once again, MultiFactorSecureAuth® automatically handles this process – by creating a user profile that uses the key to create the encrypted channel. Let me repeat, the MultiFactor SecureAuth® product, when the user successfully conducts a user-self-registration creates a Private-Public key pair AND an IPsec profile that automatically uses this key par. (Diagrams #3 and #4). 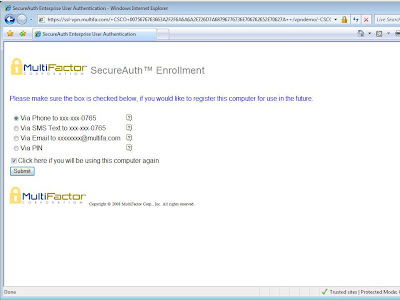 Thus, MultiFactor SecureAuth® both the two-sided coin of VPN authentication : authentication and encryption.